We've teamed up with LG to celebrate the relaunch of T3.com by giving you the chance to win a fantastic 47-inch LG 3D Cinema Smart TV. Entering the competition is simple: somewhere on the site we've hidden the T3 Golden Ticket, a bit like the one you see above. All you have to do is scour the lovely new pages of T3.com - enjoying all the great content and new sections - until you find it. 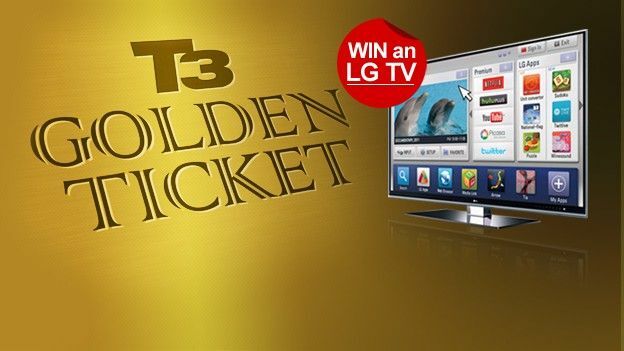 Once you've found the Golden Ticket, click the icon and follow the steps to secure your entry into the competition to win this amazing 47" LG Cinema 3D Smart TV LW980T television. Certain types of Twitter user may find it easier to locate. Or iPhone 4S owners might get hints and tricks. The full gamut of immersive home entertainment begins with the LG LW980T series, which combines CINEMA 3D and SmartTV for a full entertainment experience. The NANO FULL LED screen allows a slender design with a brighter and smoother picture, enhancing LG's position as Sky's first choice for 3D TVs. The flagship TV combines simple control, thanks to the innovative Magic Motion Remote, with the most comfortable viewing experience; plus seven pairs of comfortable 3D glasses thrown in too. That's on top of a wealth of online content through the likes of the BBC iPlayer, ITN, Cartoon Network. In addition to the groundbreaking TV, LG is launching the HX906TX 3D Sound Home Cinema system, a complete Dolby-credited 3D solution that offers an incredible 9.1 speaker experience, bringing a true 360 degree experience into your living room. * Please note this competition is only open to UK residents. Competition closes Oct 31st 2011.